Hi everyone! I know last week was a huge week for PlayStation and that there is no way that this week can match the excitement of E3, but we are going to try anyway. Starting tomorrow, we’re discounting some fantastic Worldwide Studios titles as part of our Only on PlayStation Sale. The lineup of PS4, PS3 and PS Vita games will be on sale through June 23rd. Pick up Dead Nation Apocalypse Edition, Flower, Tearaway, Shadow of the Colossus and more PlayStation exclusives at up to 50 percent off. PlayStation Plus members get an added bonus receiving up to 75 percent off. Which of these PlayStation exclusives are you going to pick up? Let us know in the comments below. Twisted metal and playstation all stars for me. Question, is Play Station All-Stars cross-buy? Sony are LIARS AND SCAMMERS and should go to court and in JAIL; why does ps4 still has no mp3 in games like you always promised us for years???? i hope you get lifetime sentence for consumer fraud! Does “N/A” mean it’s free for PSN+ subscribers? Nah i’ll pass this. I already own most of them and the rest aren’t worthy. Put Warhawk on sale, bring it back! Nothing here for me. Another disappointing week on PSN. Awesome! Picking up All Stars and Tearaway! Not a great sale. only games I’m interested in are Ratchet & Clank and they have no PS+ Discount. Come on Sony i know you can do better than this. will PlayStation All-Stars Battle Royale be a cross buy? We would kindly request if the ratchet and clank collection be put up on sale…. Also if there could be a ratchet and clank sale just like the rayman sale which was very very awesome. Did really put the same game up there 3 times just to lengthen the list? lol. hum…. ok. i take it these are for new PS+ members? but i do need to add R&C to my o so large back log :) thanks PS+. Will Sly Cooper collection will be a cross buy? i bought PS3 HD/3D S.C. collection way back when. This sale its actually the worst PS+ Edition Applied sale I saw in years. Quite not sure what to think about it. The Only on PS Titles are just 10 ? O_o Maybe TLoU or Beyond2Souls or other recently PS Only titles should’ve been on the list. And what tha N/A means? No PS+ discount applied or we need to wait ? Thats a pretty week only on playstation sale I must say. Games I already own, nothing for me except Dead Nation for PS4. Also, Sony, you should focus on bringing back MP3 and Blue-Tooth Headsets back; that would be sweet. It’d be better if we could mix our playlist with both MP3 and Music Unlimited and all games could play music in the background. There are a lot of angry people on here. Chill out already! Nobody told you to come on here and be upset. Life is good! Being positive is good! Try it out for sometime. Thanks Sony for being awesome! These are all great games! I find it amusing that we’re getting a sale that’s supposed to represent the strength of Sony’s exclusive titles, yet the list is so miniscule. Either way, I’m grateful for a sale I didn’t expect. Just thought I’d have a chuckle and point that out. Maybe I’ll finally check out PASBR. Great sale for me. Definitely gonna get PS All-Stars at that price. Maybe Twisted Metal as well. This is a lame, lame, lame sale. Swing & a miss Sony.. I already have most of these ….. but I don’t have Tearaway! Looking forward to grabbing that one… and happy it doesn’t take up too much space! Thanks guys and gals! Is PS All-Stars gonna be cross-buy with the PS Vita? Lately I don’t have that much time to play at home, and for that price I’m kinda interested in it. Not going to be mean like everyone, but it would be nice to see some more games on sale. Why no PS+ discount for the Ratchet games? I don’t see why they should be treated as “new” just because they are digital on the PS Store. They have been available in the EU store for some years already, not to mention Crack in Time is from 2009. Wow, I own every single one of those. LBP1 for $7.50 really? Someone can have mine. What about a sale on Lbp2 expansion packs? How about a Dlc sale for Vita games. Like all Gravity Rush and Escape plan. Alright, I’ll take PSASBR at $5, and recommend Tearaway and the R&Cs. Ratchet & Clank Future: A Crack in Time (PS3) and Ratchet & Clank Future: Tools of Destruction — cannot comment on these, if free then yay! otherwise I’m not sure its worth 10 bucks a pop to me. 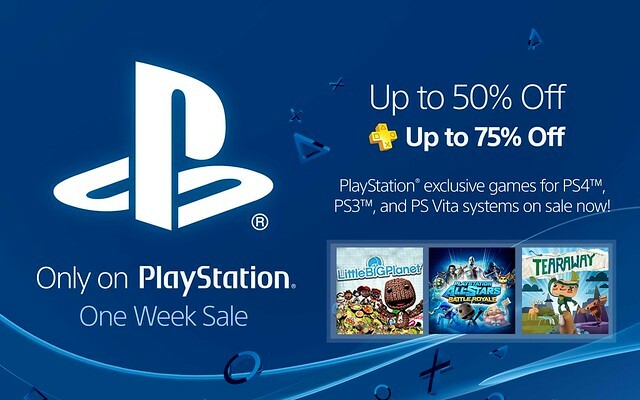 It wouldn’t have been bad to see LBP Vita on here, tho I really expected that one to be on PS+ IGC already. Honestly I see a lot of “Exclusives” missing on this list that are ancient by now. For instance the first 2 Uncharted games. As a long term PS+ member this ‘sale’ also feels a bit insulting due to half of them having been free in the past. Nothing for me, I own literally every game on this list. But, some good prices on some games, especially Ratchet and Clank Future: Tools of Destruction, which I had the hardest time finding in the first place. Though, a decent number of these games were free for Plus over the years. PlayStation All-Stars Battle Royale (PS3) tried the beta, was not feeling it. Twisted Metal (PS3) tried the beta, was not feeling it. No Journey? No buy. Also no InFamous 2, no God of War, not even LBP2 instead of 1? Dear Sony guys, this stuff is so old basically everybody owns it. I thought this sale aims to show how great the Sony exclusive game library is? Did not succeed, disappointing. I will get the Ratchet games and the Team ICO games. I would have gotten God of War if it was part of this sale. Actually, there are a lot of missing games I would have considered buying. Interesting choice of games. Each one is great. I won’t say no to a sale. Sadly I have the ones I want. If you missed Dead Nation for free on ps plus, this is a great price to buy it at.